A stain resistant carpet might be more expensive than other carpets but will last longer and remain spotless as it has a protective layer applied to the fibers. It can also withstand vacuuming and remain intact. When you scotch-guard the carpet all the fibers are protected and it prevents stains. But it is best to let a professional handle the process as they will ensure all fibers are treated and stains are duly removed. 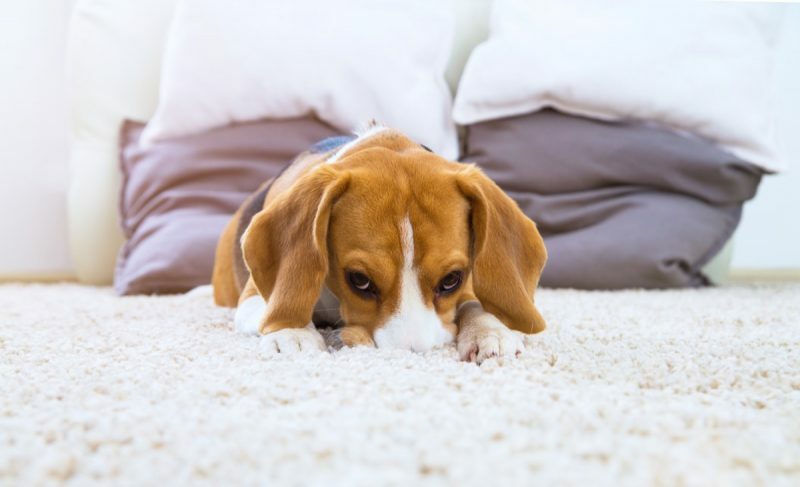 If your pet has dirtied the carpet all you need to do is remove the dirt or urine and then spray it with a commercial cleaner and wipe it. Commercial cleaners and deodorizers are aplenty and it is always best to know which ones best suit your carpet, for which you can take professional help. When your pet urinates on the carpet the first thing to do is to get paper towels and attach it to your shoes. This will help remove all the urine and not let it spread further and then clean the carpet using a mixture of ammonia and water. Sprinkle on some carpet powder and thoroughly vacuum the area twice. This will clean all the top particles and dirt and the carpet powder as well as extract all the pet hair that is embedded deep in the fibers. This process not only thoroughly cleanses the carpet but also removes all debris, hair, and particles. It is best to use a mild pet-friendly cleanser to freshen up the carpet. Larger and older stains are best to be left to professionals but for the minor pet odors and stains, it is best to keep a stain removal kit in tow. This should contain a commercial cleanser, odor extinguisher, air freshener and small vacuum. The benefit of hiring professional carpet cleaners is that they have access to a wide range of cleaning equipment and products. A team of professionals who know how to clean the carpet properly will not only ensure that it is spotless but will also add new life to it. If you need to call in professionals to clean your carpets, get in touch with Top Cleaners today!